Anti-BTC Movement - Russia Bans Bitcoin AGAIN! You are at:Home»Bitcoin Values»Anti-BTC Movement – Russia Bans Bitcoin AGAIN! 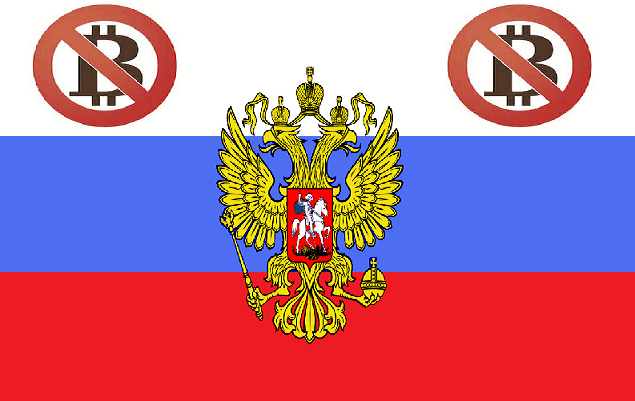 Anti-BTC Movement – Russia Bans Bitcoin AGAIN! Russia Bans Bitcoin AGAIN! Russia is no longer buying into the new crytocurrency known as Bitcoin they were credited by some of creating to dethrone the United Dollar as the world’s #1 currency! For the second time, Russia bans bitcoins stating that it violates a 2002 law signed into effect by Russian President Vladimir Putin. That law states, “The official currency of the Russian Federation is the ruble. Introduction of other monetary units and money substitutes is prohibited.” The first time it was reported that Russia banned bitcoin was back in February 2014. The Russian Prosecutor General’s Office stated that Bitcoin is illegal, and that Russian law clearly only permits the Russian ruble. This time the Russian government has taken things a step further in which the Russian Finance Ministry is preparing a bill to prohibit all cryptocurrencies, including our beloved bitcoin. Also, the Finance Ministry proposes to introduce administrative or criminal responsibility for the production and implementation of monetary surrogates. They are restricting access to information which helps in the operation and production of surrogates. There is also jail time that can be involved for violating Russia’s stance on Bitcoin and the punishment is pretty harsh. There is no legal precedent for prosecuting people that use bitcoins in Russia, but the RIA Novosti has reported and I quote, “the crime of money laundering will earn you 7 years in jail in Russia, while financial activities linked to funding terrorism can land you in jail for 15 years.” So what is the real reason why Russia bans bitcoins? The so-called bitcoin experts are scramming to come up with a number of reasons and scenarios. Why Russia Bans Bitcoin AGAIN? Some argued that Russia bans bitcoin in attempt to not further anger the United States and attract more sanctions for annexing Crimea (once belonged to Ukraine) and for supporting the rebels in Eastern Ukraine. But, I’m most entertaining claim is from a comment by a self-proclaimed bitcoin expert by the name of BlackDynamiteOnline an article written by cryptocoinsnews claiming that “All these draconian laws and bans do is force the best and brightest in your population to leave you in the 18th century. The sheep will stay behind to be fleeced by the tyranny. Innovation and growth leave the country. Stagnation and servants stay.” The real truth is…no on really knows why Russian bans bitcoin, and it is my opinion that, even the Russian government itself doesn’t have any logical explanation or reason why they have banned or planning on banning cryptocurrencies! MUST SEE: Investing In Bitcoin, Is Right Now the Time? As Russia bans bitcoin, there are still questions as to whether everyone inside of their government is on board. In July, it was stated that Russia was softening its stance on bitcoin usage and that it was accumulating information on the so-called crytocurrency known as Bitcoin. It is important to note that while this statement is true based on deputy chairman Georgy Luntovsky, you could just as well see another story in the news saying that Russia bans bitcoin for a third time. The ideal situation is that maybe they are evaluating to see how bitcoin will perform in its economy and how it can be used to expand its country’s growth. That’s my claim and I will and I’m sticking to it. What’s your expert opinion on why Russia bans bitcoin for the second time?